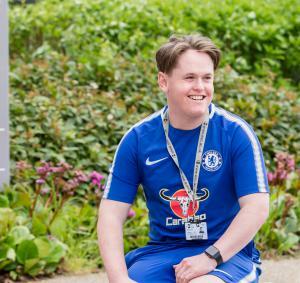 Football fan Georgie has been able to dedicate time at College to his passion: sports coaching. Currently on Life Skills Entry Level 2, Georgie regularly leads fitness sessions on Monday afternoons at College, which involves running drills and activities. He enjoys “encouraging people and helping them to improve.” These sessions are also helping Georgie to develop his own skills, as he learns to adapt his communication to the needs of others, for example using sign language. Georgie has also recently been offered a place on the Surrey FA Youth Forum, where he will be representing young people within football, and developing his own skills and those of others. He is planning on progressing to Sport Level 1 at College, before continuing in the world of sport, hopefully as a full-time coach.